SciTech Kids creates learning progressions that builds a child’s understanding over time. 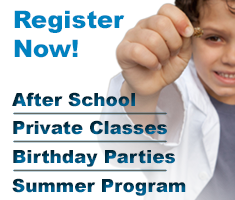 At each stage of learning, children explore, think critically, and problem solve through age-appropriate activities. Children work in small multi-age groups, which promote peer-to-peer learning and leadership. Preschoolers discover and explore natural phenomena through observations, experimentation, storytelling, and creative play. While engaging in an activity, they are invited to observe, predict and interpret their findings. Budding scientists learn about the water cycle, chemical reactions, botany, magnetism, electricity, gravity, how the body works, and how to build simple robots using cutting-edge, modular building blocks. For elementary school students, we lay the foundation of the scientific process as they progress to more complex hands-on activities. They evaluate scientific evidence and explanations as they conduct experiments, design bridges, build robots and learn about space, botany, amusement park science, DNA, the human body, and renewable energy. By middle school, students are capable of exploring phenomena on their own. SciTech Kids awaken the intellectual curiosity of these students by engaging them in holistic experiences such as forensic CSI investigations, interactive mystery science games developed by MIT researchers, and by designing communities with solar power. Through these activities, students learn to defend arguments with evidence. High school students are challenged intellectually and creatively as they delve deeper into the understanding and application of scientific principles and science content. A greater emphasis is placed on independent projects and research in which they generate their own data, analyze it, and reconfigure the information to further their science interest and, possibly, submit their project to national science competitions. Students who have honed their science skills can teach other kids by performing demonstrations at local elementary schools or afterschool programs. Some students may become part of our Research & Development team. 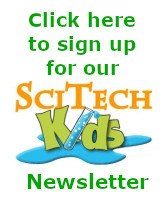 They review and rate science books, kits, gadgets, toys, and apps then post their evaluations on the SciTech Kids website.